We know it can be hard to find the perfect holiday, especially when you need the little ones to be entertained and the other half to be having fun, whilst you still get time to kick back and relax with a nice glass of something chilled. That’s what we’re all about at Atlantic Reach – quality family time together for maximum value. We want to help make your stay as relaxed and as easy as possible, so here’s a list of answers to everything you might like to know about your holiday with us before you visit. This blog is the first in a two-part series and will answer all your common FAQs about everything on site at Atlantic Reach. 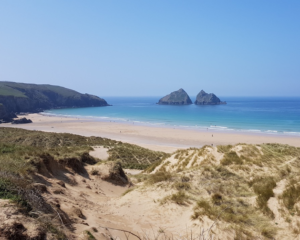 The second will give you all the info you need for when you head offsite: where you can get the tastiest pasties, the closest and cheapest supermarkets and how to get to the prettiest Cornish beaches. Without further ado, here are the answers to our most-frequently-asked questions about holidays. No need to bring the kitchen sink – we’ve got you covered with everything that you might need on holiday included as standard. In your accommodation, you’ll find fresh linen and towels for all beds and occupants (although you may want to bring some extra towels for the beach! ), a fully equipped kitchen with all appliances plus lots of mod cons such as a TV, a DVD player, and so on. Please note that towels are only included in Superior Cottage and Hot Tub properties, so please bring extra towels if you’ve booked into our Contemporary Cottage, Garden Terrace or Carworgie Terrace properties. The only other things you might need are a sponge and some washing up liquid/dishwasher tablets. Besides that, all you need to bring is yourself, your holiday wardrobe and any personal items that you can’t live without – everything else will be waiting for you. With so much on site you might struggle to fit it all in on a one-week visit! Access to all our facilities is included in your holiday; that includes our indoor and outdoor swimming pools, the gym (classes are additional £3 each) and Pirate Pete’s soft play area. Our Café is open all year round for a barista coffee and a healthy lunch, and The Manor House opens from Easter to the end of September so you can order food and eat alfresco by the outdoor pool if you’d like. 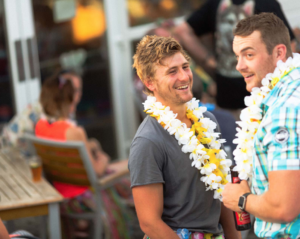 We also run BBQs by the pool in the summer which are perfect after a day at the beach. If you’d like a little added luxury, some of our Garden Terrace and Contemporary Cottage properties have private hot tubs so you can relax under the stars. There are lots of big open grassy spaces to play in, plus plenty of parking on site and a shop that stocks groceries and holiday items, which is open over the Easter holidays then from May half term to the end of September. It’s really easy. Simply park up outside reception and head to the check in desk where our friendly team will be on hand to point you in the right direction and give you all the info you need. You can download our app too (simply search for Atlantic Reach the App Store) and follow the instructions. There’s also a countdown clock on there to get you really excited about your holiday! There’s certainly no need to leave your pooch at home! We have lots of pet-friendly lodgings including Contemporary Cottage, Garden Terrace and Carworgie Terrace accommodation. If you’re bringing your woofer, we charge a supplement of £50 to make sure that our pet-friendly accommodation is deep cleaned and sparkling ready for the next visitors and that the same standard is available to you when you arrive. We allow two pets per property. Dogs are welcome in the bar of the Manor House Bar & Restaurant and the Café. More info can be found here. Please note that dogs are not permitted in hot tub properties. What are the best deals on holidays? 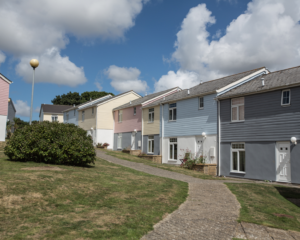 At Atlantic Reach, we’re all about maximum fun for maximum value – and if you want to stay in proper bricks and mortar, we guarantee that you won’t find your Cornish break cheaper anywhere else! As a cheeky bonus, the fourth night is always FREE on three-night stays. We always have different deals on throughout the year, so it’s best to check our specials offers page for the latest, hottest deals. To give you a little flavour, a short break for a family of four with us right now starts from £139 – that’s less than £9 per person per night. What’s open onsite in and out of season? There’s a tonne of stuff and activities to enjoy year-round at Atlantic Reach. For the little ones, there’s Pirate Pete’s soft play and an outdoor play zone. Tennis courts, table tennis, pitch ’n’ putt golf and football golf are available for the older ones, plus our Café is open all through the year for a tasty bite to eat. Adults can enjoy access to one of Cornwall’s biggest and most well-equipped gyms with a complementary Leisure pass (classes are extra at £3 each) or you can unwind in the wet spa facilities at Indigo Spa (extra treatments at your own cost). Our warm indoor pool is open year-round and access is included in your holiday. The only things that close out of season is the outdoor pool, the trampolines, the amusement arcade and The Manor House (only open on Sundays for lunch). We’re always adding pop up activities and special events, so make sure you ask reception to stay up to date! What kind of entertainment do you have in and out of season? Our entertainment schedules are legendary! They change for each season, so make sure you’re up to date here. From Britain’s Got Talent finalists and top magic and illusion acts to leading party bands and comedy ventriloquists, there’s something for all the family to enjoy. During the summer and main holiday periods, there is something on every day; children’s entertainment starts from 6.30pm and if you’re travelling with toddlers, we have a range of activities from bubble and balloon parties, animal encounters and bouncy castle fun to keep them entertained. Just ask reception ‘wazzon’ when you arrive so you don’t miss any of the action during your stay! Of course! Whether it’s a flying visit or a long family break, there’s a flexible option to suit everyone. Stays can range from two nights up to as long as you’d like! Did we mention that all three-night bookings get an extra night for free? Are there any housework rules? A full and thorough cleaning service is provided before and after your stay. All we ask is that you take care of your accommodation and treat it as a home-away-from-home. Smoking is not permitted inside any property at Atlantic Reach. We hope we’ve shed some light on exactly what’s included in your Atlantic Reach holiday, but please give one of our friendly team members a call on 01726 860775 if you have any further questions – they’d be more than happy to help. If you’ve liked what you’ve read and you’d like to book a holiday, just follow this link. We’ll see you here soon!